TheBloomOutlet.com | You might want the best for your wedding since a wedding is one of the greatest and the most important event you will experience in your life. This is why you have to be well-prepared, including in preparing the best bridal bouquet. There is so much kind of flowers that are beautiful for you to choose as your bridal bouquet, but only the best flowers in the best bridal bouquet arrangement is worth it for you (the bride) to hold on your wedding day. Here you will finally understand that the same kind and combination of flowers can look very different depending on the arrangement or the shape of the bridal bouquet. A bridal bouquet in the round shape is the most popular one. This flower bouquet is arranged in a globe or a round shape, just like its name. This is a very traditional yet beautiful look for a bridal bouquet. Simple and elegant is the impression this bouquet, perfect for both casual and formal weddings. Crescent is a bouquet shape that consists of flowers and some greenery that arched from the center until tapered at the ends. This form of bridal bouquet is best suited only for a formal wedding. However, the crescent bouquet is favored by most brides because the natural and beautiful way the flowers seem to fall from hands when holding it. This pageant shaped bouquet is the long stem flowers that arranged in a sweeping fashion, this way the bouquet can fit into the bride’s arm nicely. This bridal bouquet can be used both for formal and informal weddings, too. This bouquet shape consists of great amounts of flowers at the base of the bouquet and slowly taped along the bouquet’s length. 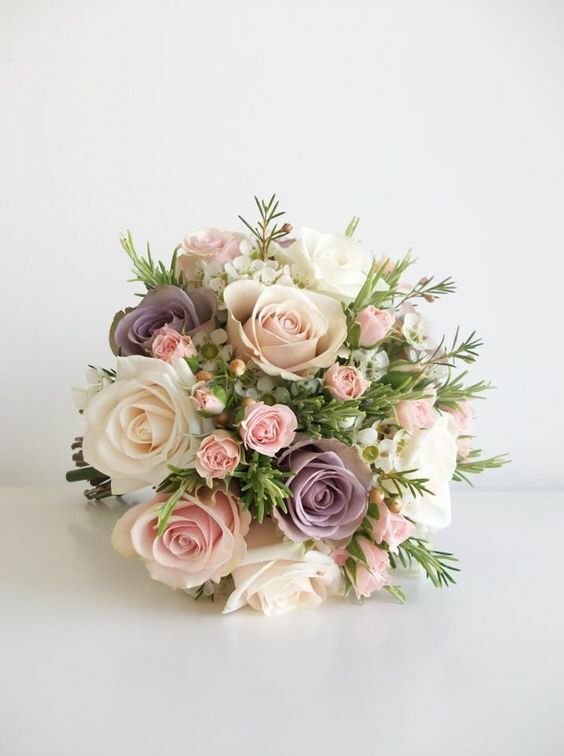 The appearance of this bridal bouquet will give a sense of elegant and sophisticated flower, and this kind of bouquet shape can be used for casual or formal weddings. Although the heart-shaped bridal bouquet is not really appropriate to be used in a formal wedding theme, this bouquet is still can be a casual choice for your romantic wedding. Because the heart itself is the symbol of love and the perfect arrangement of it will have its own romantic quality. This bouquet will add the sweetness and girlish vibes to your wedding party. This is an organic or hand-tied flower bouquet that has an epitome of casual elegance. The loose bridal bouquet has a characteristic like a greenery and stems of flowers loosely tied together by ribbon or wire. This kind of bouquet is fit for beach weddings or other wedding ceremonies that are more casual. After all, the choice is always on the bride’s hand. After discussing the theme of the wedding, just don’t forget the flower arrangement and bridal bouquet to buy that will look perfect together on your beautiful wedding day.